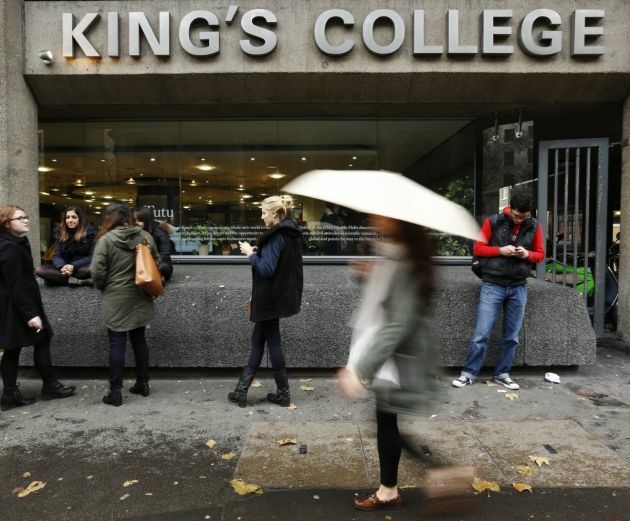 (Photo: REUTERS / Olivia Harris)People pass a campus of Kings College in London November 12, 2012. Bishop Philip Egan of Portsmouth has stirred a debate in Britain by saying that secularism is too frail for a free society and that the Gospel alone offers a genuine humanism that can change human living. The Roman Catholic bishop made a speech March 6 at King's College London, where he studied in the 1970s, delving into Christianity and the rise of secularism in the United Kingdom. The National Secular Society called Egan's speech a "fantasy." "Secularism is too fragile a basis for a free society...the Gospel alone can offer an authentic humanism able to transform human living," said Bishop Egan in his speech. He contrasted how Britain's constitution and legal system were shaped over a long period by Christianity and the natural law while now it is led by "pressure-groups and media, business and commercial interests." "Shorn from its moorings, the law is thus increasingly adrift," Egan said. "It expresses the will of the legislator, the will of the loudest and most powerful, the will of a policy unit or the will of the majority, and this relativism is State-enforced." Bishop Egan was invited to give to speak by Father Joe Evans, the university's Catholic chaplain and among students and faculty who attended were members of the Catholic Society and the Anglican chaplain and his assistants, Catholic News Agency reported. "In Britain, a secular culture is now in the ascendant, although the terms secular, secularism and secularisation are ill-defined. "Indeed, secularism is more an attitude or atmosphere than a fully worked-out system of thought. Yet essentially, secularism means a concern with the saeculum, the world, this world rather than the next. "Secularism has a political dimension: the principle that Church and State, religion and politics, must be strictly separated. In other words, to protect the equality of every citizen in a pluralist society, politicians and policy makers adopt a neutral attitude towards religious groups and personal life-style choices, as long as behaviour remains within the law." Under secularism he said religion which includes beliefs about the meaning of life, the morally good, God and life after death "are ring- fenced as matters of private opinion." Egan cited the National Secular Society, which he described as "hardline," as systematically seeking "to exclude any religious expression from the public square." The National Secular Society hit back at the bishop in its blog and opinion section on its website entitled, "The bishop's fantasy secularism." The blog said, "Secularism is the only way that a multicultural, multi-faith Britain can survive without succumbing to the religious warfare and sectarianism that has plagued Europe for centuries – most of it emanating from the Vatican. 'Secularism can sustain and build on the advances that Britain has made - all of them achieved in the face of persistent and sometimes fanatical religious resistance. "It protects freedom of speech – having, in the main, dispensed with the religious concept of blasphemy, a concept that has hobbled free expression down the centuries." It noted that secularism enables everyone a free vote and the chance to decide their political stance without it being dictated from the pulpit. "A secular society makes its laws based on reason and fact, not on the dogmas of a long-past era that has little connection with the lives we live now." Egan said secularism, "has its own theological terms such as equality, diversity, freedom, respect, tolerance, non-discrimination, multiculturalism, social cohesion, ethnic communities, inclusivity, quality of life, sustainable development and environmentalism." Such values said Egan stem from fundamental Christian values. "Thus, the secular concern for tolerance comes from the biblical 'love of neighbor' but, disconnected from Christian practice and belief, it has become a soft value, free-wheeling, expanded with new meaning, now permitting what formerly was unlawful." As well as secularism and the demise of Christianity in Britain Bishop Egan discussed three of Pope Emeritus Benedict XVI's writings on secularism; and the Church's role in strengthening the Christian patrimony of the country.